Deep Thoughts: So, how about the footage of that man that got stuck in the elevator for 41 hours in 1999? When I saw the portion of the clip where he is lying on the floor with his hands behind his head I wondered what he was thinking about... what I would have thought about. I wasted 2 minutes thinking about that; guess that means that should the stuck elevator opportunity present, finding 41 hours of entertaining thought will be effortless. No Ty, I wouldn’t calculate ridiculously high number’s square roots. 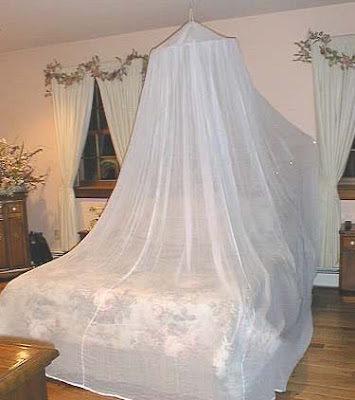 Good Buy: I'm thinking about buying one of these (above) so I can sleep on the trampoline this summer. I really want to buy one of these (below), because it is cheaper and doesn't look quite as nerdy, but I'm not sure how I'd hang it. Actually I have an idea on how to hang it, but knowing me, there is a 97% chance it will fall on me in the night. My blanket & couch cushion forts were ALWAYS the most fragile. Nothing's changed. Road Trip: a journey via automobile, sometimes unplanned or impromptu. Until this year, I always felt a little depressed when people mentioned college road trips. Maybe not depressed, but definitely did a mental curse of, “another college experience you didn’t seize.” But really, how do you have a road trip on an island? That’s called a circle. Though I don’t have the college label to prefix ”road trip,” I do have Calvin and Jane. In the beginning, it was a big red/tan two toned jacked-up suburban, Mrs. Piggle-Wiggle read aloud, and cassettes with every gunfighter ballad ever sung. Over the years it has morphed. The jacked-up suburban died. If Jane tries to read aloud, she soothingly reads herself to sleep on the first page. But Marty Robbins, Sons of the Pioneers, and Frankie Laine… you and your gun ballads live on. Calvin and Jane, thanks for 24.9 years of entertaining road trips, especially the one in July of 2007. I think Abe, Ty, Ande, and I got some comical advice out of that one. Killing bugs: I found the above pictured documentary on bugs at the library last year. As I watched it for the first time, I honestly stared open-mouthed in fascination/repulsion. The kind of open-mouth where your jaw dropped and you forgot to snap it back shut. Ever since, it has been my favorite documentary. If we’re being really honest it is contender for my favorite movie of all genres. One whole portion was dedicated to different wasp species. Wasps are the meanEST insect. A majority of wasp species lay their eggs inside another living organism (ie: other insects, plants, and even cows) with the idea that they will live off the organism as a parasite, eventually killing it. I found a wasp in the windowsill today. I captured him in jar and left him on the counter. My mom found him and asked why I was saving him. I replied I hadn’t decided what to do with him yet, maybe just study him. Ande hollered from the other room, “Okay Hitler.” Suddenly I’m in a dilemma. 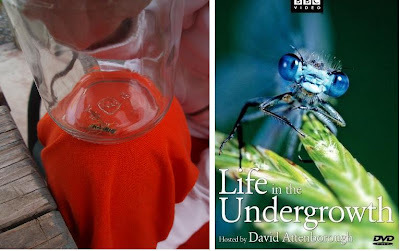 I have a wasp in a jar, and I don’t know whether moral dictates death or release. That July 2007 road trip was a funny one...there's nothing like a captive car audience that can't escape for you to want to shovel all the advice you meant to give earlier. Your dad and I are no dummies, we know how to seize an opportunity :) Which reminds me, remember the book I read aloud that trip? THE FIVE LOVE LANGUAGES. I took a lot of guff for that one. Yea, that was a great car trip. About the wasp. I have no answer. No suggestion. None. But the irony did not escape me that you put him in a honey jar. I sure enjoy your blog, thanks for keeping one. Thank you Neighbor Jane. You are my most faithful commenter. That's right, your Love Language book provided me with a whole new vocabulary and made me realize you can make love demands... you can't get upset if I blatantly let you know my LOVE TANK is empty. cali.......this is your dad......if you couldn't tell.....i think you should kill the _ _ _ _ wasp......if you had more of my genes it would have already been dead.......finished. I love your blog! I have a great idea: Road Trip '08 to Utah! That sounds like a great idea to me. I think we sold our house, and we are moving May 23rd. Crazy! I can't believe it!